IRS Obamacare enforcement: Massachusetts Senate ad blames Ed Markey. 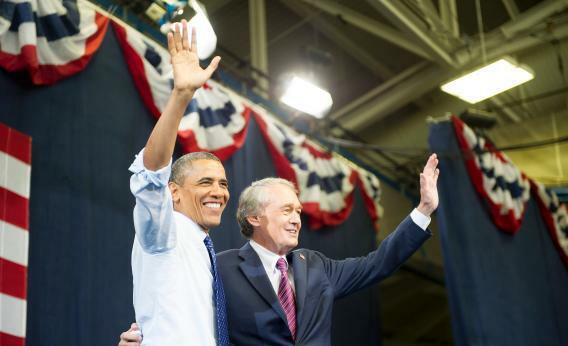 President Barack Obama and Sen. Ed Markey (D-MA) wave to the crowd at a rally in Boston on June 12, 2013. Every Smart Republican agrees: The IRS, never popular, is dredging new depths of pure public hatred. And that same IRS is going to enforce the health care mandate when it comes into effect. So why not hang the IRS around Democrats’ writhing necks? The blandness on display is impressive. You hear that Markey and Gomez both “support health care reform,” and it means—what exactly? Gomez’s health care position consists of three sentences, one of which ribs “so-called solutions like Obamacare,” so we can assume he’s agin’ Obamacare. Markey’s IRS vote was actually the vote to create the health care law, toward which there’s no usable majoritarian anger in Massachusetts. This has been a predictable election, with Markey outspending Gomez to the tune of $4 million, so pundits seem unready to draw big lessons from it. But we’re finally seeing a message that, if successful at all, will be recycled all year.